Tom and Mary O'rally lived just over a small hill, the Lawrence children's only close neighbors. The O'rallies would bring milk to the Lawrence's regularly in good weather in trade of an occasional meal or time of informal fellowship or special anniversary or holiday of some sort. They also leased land to Tom for gardening – so he would pass by in the summer quite often on his way to his fields. Noah and Tom were especially good friends. Soon after the storm died down, Tom and a couple men from town came to bury Frederic Lawrence. It was just shortly after that Julia became sick and Lucy told Vern to go get Mary. “Too many late nights in the cold?” Mary asked. She at once informed Lucy that their mother had pneumonia. And that they should have come for her sooner. But Lucy felt it was even more than pneumonia. Julia hadn't been the same at all since Frederic died. She felt her mother was dying of a broken heart, mournful. Lucy and Mary stayed up all night. Ann stayed up, too, for a long while. But Lucy noticed how her eyes were bloodshot and in need of rest. “Why don't you take Julie to our room? I think she needs rest – and someone to cuddle with,” Lucy said to Ann. At first Ann seemed hesitant to leave their mother. But she took Julie's hand and lead her away. Lucy knew their mother wouldn't make it. She hated herself for being so resigned. And she couldn't cry. Not even when Mary announced their mother had passed the very next day. Lucy knew she wasn't convinced. Mary looked troubled, but didn't say anything. It didn't take long for the town to hear about the deaths of the Lawrence parents. Many gathered at their home as Tom lead a short service, burying Julie next to Frederic's fresh grave in the family cemetery. It was a good service – one that Lucy knew her parents would have approved of. Mary stood between Lucy and Ann, holding Julie in her arms. It was comforting having another adult close by, even if she had to leave soon. Lucy gulped at a thought, “We are orphans now. And Vern and I have to care for everything. And everyone.” She did not say these words out loud – but they felt loud in her mind. Vern was nearly 18 and she 15. But neither of them were ready for this work before them. Her eyes were already full as she watched the last of the dirt fill her mother's grave. Tom, Vern, and Noah stepped away from the two mounds, both fresh. Noah was still crying. His face was smeared with the dark soil that now covered their parents. Lucy left the warm side of Mary and gave her little brother a hug. He cried into her shoulders. She found herself finally able to cry a little, too. But not too much. She was the new mother – but even as she thought this, she cried harder than Noah. Many of the town's people that attended their parent's funeral brought dishes of food. 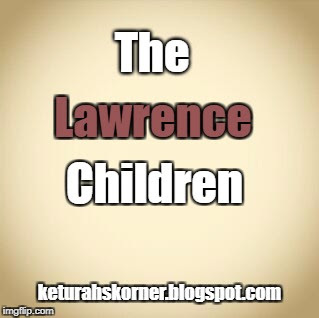 No one stayed for a meal – for that the Lawrence children were thankful. They were not in the mood for putting on the act a formal meal required. Several women requested that some of the small children stay with them for the night – or even a couple weeks. When Lucy heard them ask she panicked. The town's people looked ready to differ, but Tom hushed them. Mary had wanted to bring Julie home, too. Out of everyone Lucy trusted her. But she couldn't let any of her family out of her sight. Not right now. “You understand, we need to be together right now?” Lucy asked Mary. She didn't want to offend the woman. She just wanted everyone safe and together. “The path should be good enough for the kids to start going to school again tomorrow,” Vern said that night over dinner. The path had been good enough for some time, Lucy knew. But no one had felt like continuing life outside their home quite yet. Vern was saying it was time. It was just three days after the funeral. Lucy hadn't made anything fancy for dinner. You were supposed to have lots of food at funerals. She knew this because of the novels she read. Yet life never seemed to be able to imitate every detail of fiction as one would like. She didn't have the strength to live up to a picture perfect novel. Especially tonight. The food from neighbors, kept cool in the cellar and snow drifts, would suffice just a bit longer, and merit what they needed. “That is good,” Lucy said to Vern. It was about time they started attending school again. No one was going to fall behind just because she and Vern were in charge now. But as she looked at Julie, Lucy knew they wouldn't all be able to attend like before. Someone needed to care for the baby. “Will you still be studying? Like Mother had you do?” Lucy already knew what she had to do. But she wanted to make sure they all kept to their parents wishes. Even Vern. Noah looked up from his food, his face showing sharp worry. “No, we won't,” Vern replied quietly. His tone made Lucy's skin tickle. The reality of their situation hit her more. Vern would have to do more than she thought. “But you are right. Noah should keep going to school for now. And I'll try to study when I can. Evenings or weekends?” Vern's words drifted off, and even as they did Lucy knew that it would be very hard for Vern to keep studying. He would be working too much – and when he was home he'd want to sleep or eat. “You – what?” Lucy could tell he wasn't expecting this. Vern slouched over his beans. Lucy felt everyone on her side, nodding at Vern. “I won't tie her to a tree.” Vern said, obviously giving in to what would need to happen for things to run smoothly. Ann let out a small laugh. The whole room was thrown into a fit of silence as they all stared at her. It had been so long since anyone had laughed. Especially Ann, their bubble enthused sister. Ann's face turned red. Lucy didn't know what to say – it wasn't bad that Ann had laughed. But it was evident Ann felt guilty. Lucy knew she should say something. But her own throat felt blocked. Vern nodded. “Very. We need you to laugh for us.” He smiled at her – Lucy could tell his smile was strained, forced. But it resulted in another small smile from Ann. Lucy wanted to smile. It was nice seeing Ann smile, nice knowing Vern was able to be strong when Lucy couldn't. It was nice knowing they would all have to learn how to live again together, and each have a part. Their own struggles and sacrifices would compliment each other, helping them all to find life again. The next morning Lucy woke up early. She and Julie now slept in Father's and Mother's old room. She felt bad for taking their room – but Julie had still slept in bed with her parents. And Lucy didn't want to leave her alone their empty bed or move Julie to her own. She had invited Ann to move rooms, too, but Ann refused to enter her parents' room. Lucy made sure not to wake Julie as she left the warm bed for the cold floor. She made sure all the blankets were piled just right around Julie then walked into the outer room. Lucy stirred the coals and started working at the fire. Soon it was burning hot and she was able to set a tea kettle on, and another pot for breakfast cereal. Soon Vern came crawling down the ladder followed by Noah. Lucy smiled at both of them and offered them each a cup of coffee. Noah nodded and began drinking his coffee. Lucy wanted to protest, but she remained silent. It would be better if Vern ate in the kitchen. But this wasn't worth fighting over. She knew he didn't want to waste any time getting to work. After the boys went outside Lucy woke up Ann and Fred-O, had them dress for school, and sat them down to eat. She would let Julie sleep as long as she wanted. It was too cold to make the little girl get out of bed. Lucy nodded. “Here, eat.” she sat a bowl of porridge in front of him. “Vern is so grumpy today,” Noah said to no one in particular. Ann and Fred-O stared at him, eating and saying nothing. Their eyes were wide as if they were still fighting sleep. “Sounds like Vern isn't the only grumpy one,” Lucy smiled. Noah shut up and ate his food. Lucy scooped out her own food and joined her three siblings at the table. They all looked tired, not ready for a school day. She half felt bad for them, even as she thought how she should be going with them if life was fair. Lucy shook her thoughts away. Vern shouldn't have to be the man of their home. It wasn't about fair anymore, but what was right. The kids finished eating and Lucy handed them the lunches she'd packed along with their books. No one argued, thankfully. Noah jumped on the sleigh and Vern handed him the reigns. Fred-O obeyed and sat beside Noah as Ann followed. Lucy then tucked the blanket all around them. “Want seems like a powerful word,” Vern winked. Lucy would have stared after them and cried if it weren't for the cold wind and Vern watching. She ran back inside to proceed fixing Vern's breakfast and lunch. “There are so many things to do,” Lucy thought. But that was OK. At least she wasn't staying home to an empty schedule. “See you. Have fun.” She called out as the door shut after Vern. Lucy looked around the kitchen. She was alone, she realized. For the first time she was alone. Lucy let herself fall into a chair at the table. For a second she stared at the wood grains of the table, and then she let her head fall. She cried for her parents. She cried for Vern's and her future and all the hardships they would face. She cried for how she would manage this house and the kids. And she cried for Julie – Julie. Lucy looked up suddenly realizing that she wasn't alone. No, she had Julie. “You cry when you are tired?” Julie's question was asked with wide open eyes, as if this were the strangest thing she had ever heard. “Want something to eat?” Lucy stroked Julie's small head. Lucy eased Julie off of her lap and set her on a chair. As she poured out Julie's food Lucy's need to cry vanished, replaced with purpose. There would be so many things to do today – studies, housework, and of course watching over little Julie. There wasn't any more time to cry. Lucy tried to smile for Julie as she handed Julie a bowl of hot porridge.